Delicious delicious home-brewed beer from the Sprig and Fern. The pavement is wet and I just know there’s a trail of dirt up the back of my shorts. Great. Raindrops are clinging to the lenses of my sunnys, but I have a hope it can’t rain the whole bike-ride to work. Why would I be going to work then? Seriously? I’d much rather still be in bed, but I keep on biking. It looks dodgy out here, but there’s some comfort. There’s a familiar woodsy smell as I pass a row of houses on High St. They’ve lit their fireplaces. In the summer. And then I realize how cold my hands are, the rain not helping their grip on my handlebars. I hate having cold hands. I honestly hate it. But it’ll be OK. I threw a pair of sweats in my backpack before I left the house. So part of me should be warm … I think. But my shorts are already soaked. I hope my backpack is waterproof. I kinda wish I was in front of that fireplace. It’s too cold for late January. It’s too cold for summer. Is that snow on the mountains? 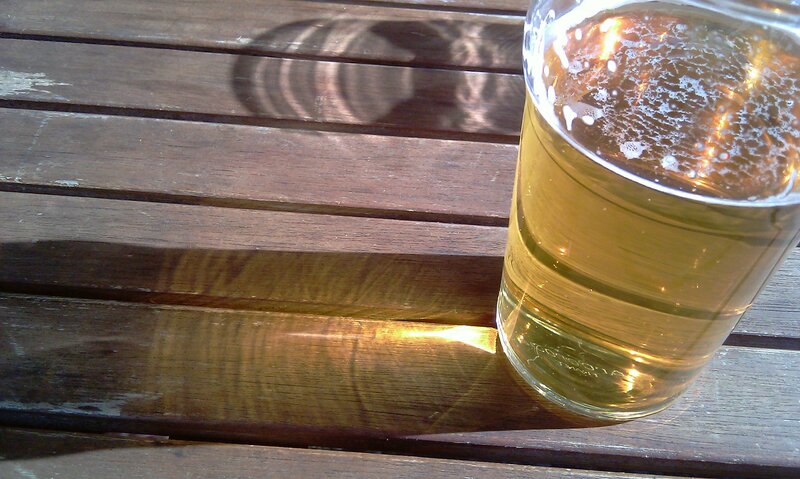 There were a few beers after work – work which was cut short due to high winds and low storm clouds. I was right. And I miss my bed. A few beers makes the bike ride home easier though, especially when my knees are aching so much. Stupid mysterious illness. My shorts are finally dry, but my sweats are far warmer. It’s going to be a cold night. I’ll need an extra blanket on my bed. But at least my room beats the bunkhouse. Not like that’s hard. And at least I have the next day off, which will give my body a rest. Well, not before I meet the girls at the Sprig and Fern for some fine home-brewed beers. I do love living in this small town. And then it’s sleep-time. And then it’s sleeping-in-time. And then it’s beach-time! At least if the rain stops. And if not, it’s just more sleep-time. I can handle it. To the Sprig and Fern! I'm a has-been that was. I'm a dreamer that does. can you feel the sun?